Für schools of general knowledge, Brick’R’knowledge offers various topics. On one hand, deeper electronical knowledge can be achieved with the Advanced Set, on the other hand it is possible to measure voltage, current, etc. with the helop of the Measurement Set One and Two. Additionally, the intersting topic of renewable energy can finally be delivered in schools with the Solar Set. Those sets offer a lot of experiments for the pupils which are also suitable as group projects. For combining analogue and digital electronic, the Arduino Coding Set which was developed with Arduino is available. Plugging bricks together is an easy and fast way – but we still believe that pupils should also be able to solder by themselves. 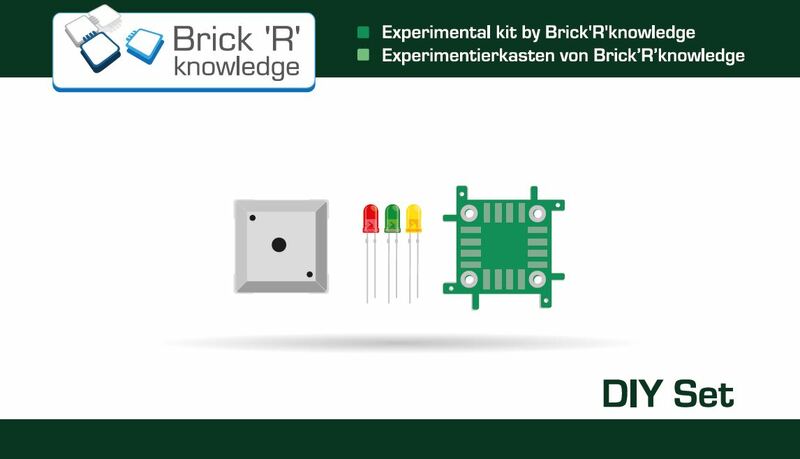 For this case we offer the DIY set which is perfect for creating and developing own bricks in the class. The basics of computing can be learned with the Logic Set which teaches logic gates, adders and everything else that has to do with digital circuit technology. The Internet of Things Set enables exciting group projects for the topics home automation and website programming. 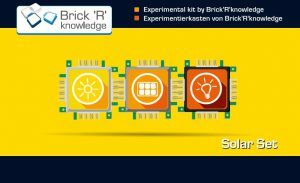 Solar Set The Brick’R’knowledge solar set guarantees fun with experiments for the whole family and introduces renewable energies in a playful and easy way. How does a solar cell work? How is it possible that an accumulator stores energy? How can you build a night light with a motion detector? Those questions and many more will be answered with the set. Advanced Set Our Advanced Set contains 111 components, which enable building more complicated and complex solutions. 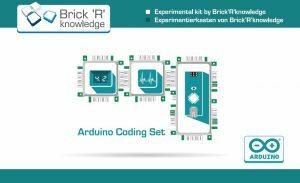 Brick’R’knwoledge teaches electronic engineering with it’s components, units, and operations in an innovative and playful way. Thanks to the educational system, knowledge can be gathered, so that not only you but also our next generation can profit from it. 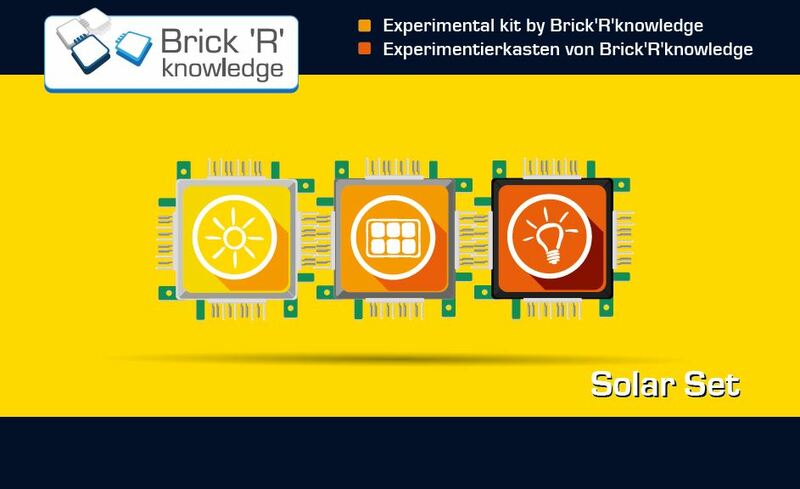 The different bricks can be build to individual circuits by clicking them together. Simple as well as complex electronical and technological topics can be experienced in a totally new way. Due to the open-source factor, bricks can be added and own solutions developed. 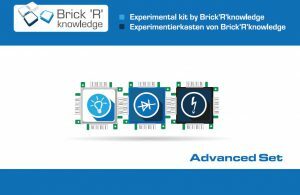 Brick’R’knowledge isn’t all about basic electronical engineering, also RF experiments can be realized, which make the system worldwide unique. Oscilloscopes and signal generatores are soon-to-be integrable components in the Brick-system, that will fulfill industrial requirements as well. Arduino Coding Set Get in touch with digital electronics and start understanding programming with the Arduino® Nano, which is included in the kit. 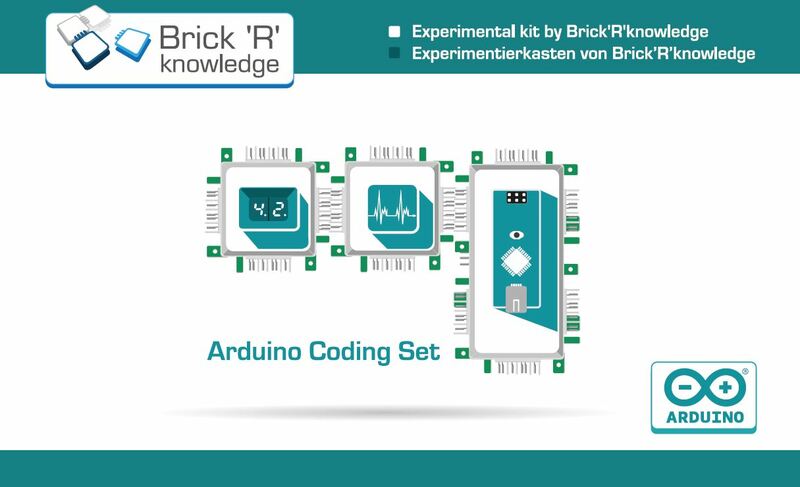 It is our first kit with digital components, such as 7-segment displays, OLED display, D/A converter or I2C Bricks, complementary to all analog bricks. To get you started with the popular microcontroller, we support you with various programming examples. 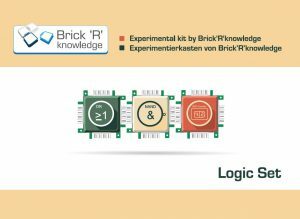 Logic Set The Logic Set is ideally suited for a quick start into the digital circuit technology. While working with the manual, which includes didactically structured examples of circuits, students learn about the most important digital circuits like adder, shift register and numerator. The comprehensively equipped Logic Set provides teachers with a practical basis for daily teaching. Plugging the bricks together and experimenting with them is fun and encourages building your own circuit variants. 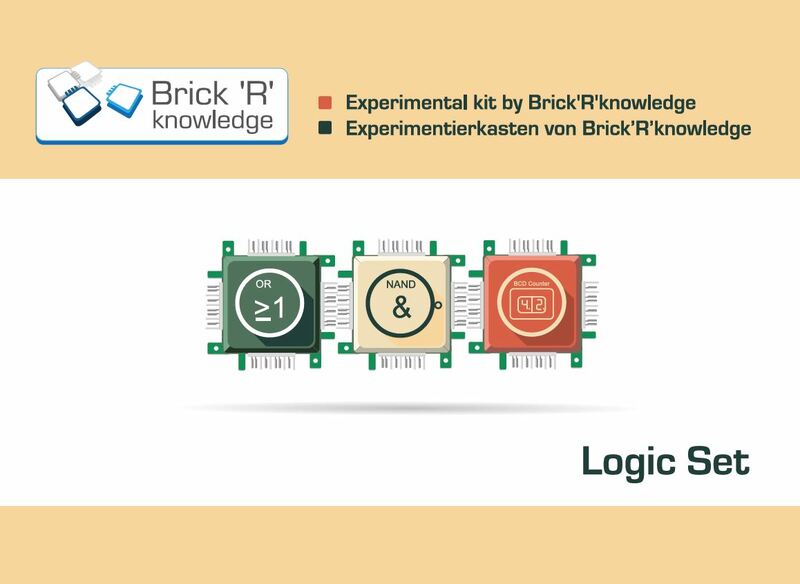 The Logic Set’s scope of supply ranges from easy logic bricks (AND, OR, NAND, NOR, XOR, XNOR, NOT), to a variety of flip flop bricks (D-, RS- and JK-type), to an impulse brick (alternatively a debounced switch for single pulses) up to a BCD counter brick with an integrated 7 segment display. A wide range of LED bricks, switch bricks and wire bricks make the set complete. 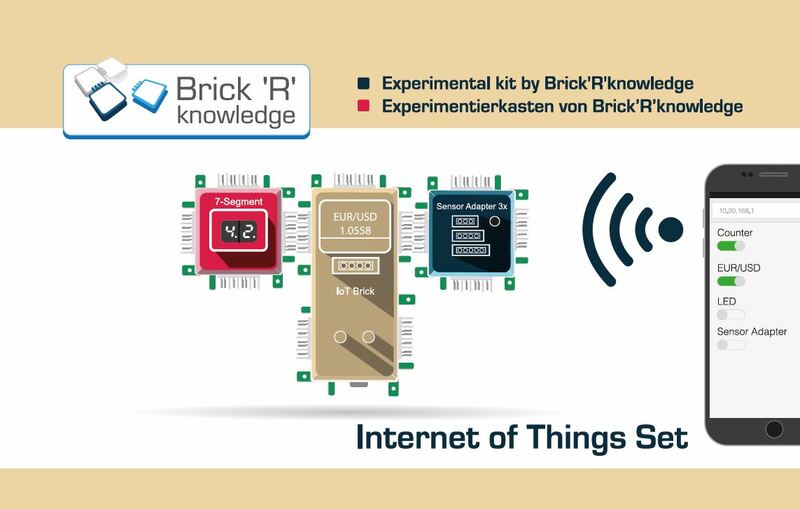 Internet of Things Set With the Internet of Things Set it is finally possible to control your Bricks via internet. With the included IoT Brick you will learn how to build your first website and control I/O pins via smartphone. Furthermore, the set contains a temperature and humidity sensor and you can display its values on a display: the first step towards your own home automation! You can collect data e.g.  exchange rates from the internet and display them. To drive the 7-segment display, the so called I²C bus is used, you will get to know it soon as well. The Internet of Things Set is waiting for you to get explored! DIY Set Here you can create and develop your own Brick world! The set contains PCBs, 25 plastic housings, various resistors, connector parts, capacitors, transistors, diodes and LEDs. Additionally, youi will receive 3 meters of tin-solder and a tapered spool for more DIY support. The Measurement Sets enable you to measure the voltage, current and other measured variables with standard measuring instruments.